You are here: Home / News and Media / News / When a Tree Falls, Is It Deforestation? The narrative is not a new one: The world is losing tree cover at an alarming rate, and the effects on biodiversity, the climate and indigenous communities cannot be overstated. The question is, why? What’s causing this loss? And will tree cover come back, or will the land be used for a new purpose? Our new study, released today in Science, gets us one step closer to answering these questions. Together with The Sustainability Consortium and the University of Maryland, we visually interpreted thousands of satellite images in Google Earth to identify what caused forest disturbance around the world. We used this information to train a computer model to determine the most likely drivers of tree cover loss that was detected globally between 2001 and 2015. Starting today, the map is available on Global Forest Watch. Five drivers of tree cover loss are shown. Understanding the implications of each of these drivers helps provide more context about the status of global forests. The results of this analysis are meant to identify drivers at a global or regional scale, interpreting the results at a local level is not recommended. The analysis indicates the dominant driver of loss within 10 km cells, even though multiple drivers may be present within a given cell over time and space. 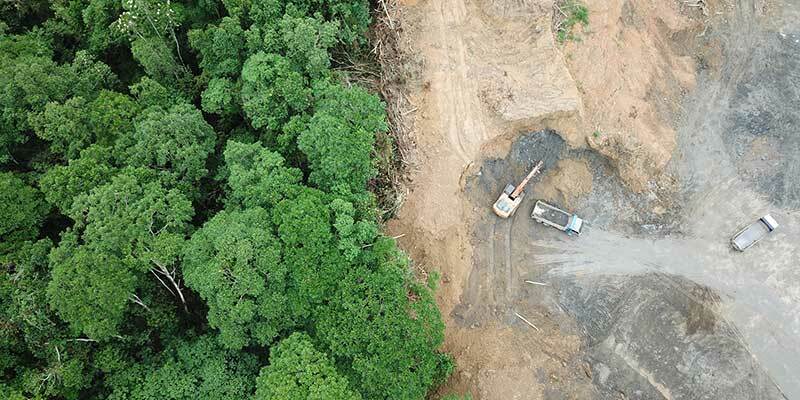 Commodity-driven deforestation was the dominant driver associated with 27 percent of gross global tree cover loss between 2001 and 2015, equivalent to a deforested area approximately a quarter the size of India. This type of loss exemplifies the definition of deforestation, as it reflects a permanent conversion of forest cover into something else. In this class, trees are cut down to make way for activities like agriculture, mining, and oil and gas production. We see the most commodity-driven deforestation in the tropical forests of Latin America and Southeast Asia. https://www.sustainabilityconsortium.org/wp-content/uploads/2018/09/news-wri-deforestation.jpg 400 800 webmaster https://www.sustainabilityconsortium.org/wp-content/uploads/2019/01/tsc10-logo-2.jpg webmaster2018-09-13 10:00:282018-09-20 08:53:14When a Tree Falls, Is It Deforestation? Trase | Are zero-deforestation pledges slowing deforestation? Infographic Design by Giada Mannino, Senior Designer, TSC	Global Forest Loss - Who’s in the driver’s seat?